First Cafe allows for fellowship between services with free coffee and snacks. This will now be held from 9:00 - 11:30 AM. Book Club - Monday, April 22, 7:00 PM. Join the book club in the library to discuss Educated by Tara Westover. We welcome new readers who would like to join our discussion. 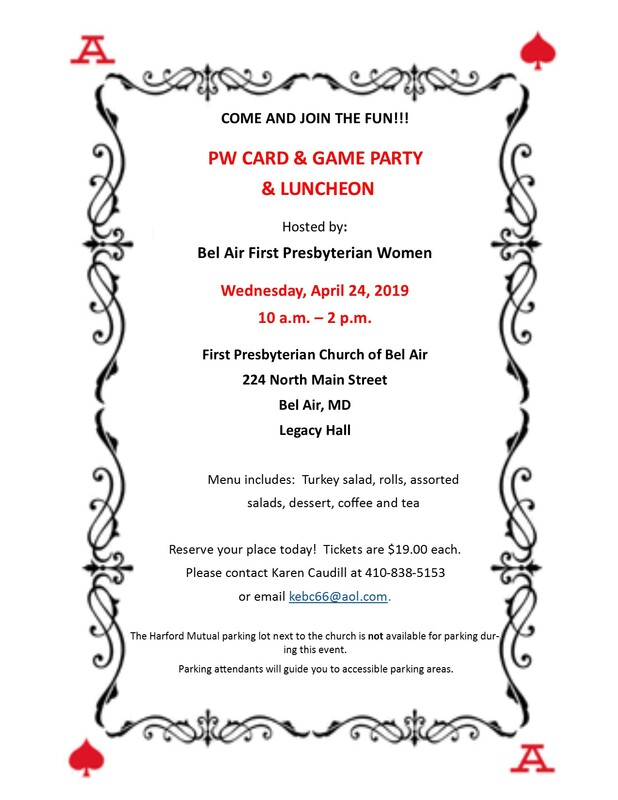 Presbyterian Women Card and Games Party - Wednesday, April 24. Please plan on joining us for a morning of fun and a delicious luncheon! The menu includes: Turkey salad, rolls, assorted salads, dessert, coffee & tea. Tickets are $19. Download flyer here. Spring Fling Luncheon - Sunday, May 5. Join the Deacons for a luncheon after morning worship. Book Club - Monday, May 20, 7:00 PM. Join the book club in the library to discuss March by Geraldine Brooks. We welcome new readers who would like to join our discussion. NO SUNDAY SCHOOL on Easter - Sunday, April 21. Children's Choir Practice - Sundays at 9:00 AM. Youth Lock-In - Friday, May 17. More details coming soon. Vacation Bible School - Monday, June 24-Friday, June 28. Save the date!